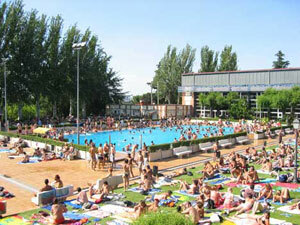 The main gay area is in the neighbourhood Chueca. It is remarkably compact, with virtually every gay establishment either on Plaza Chueca (at the Chueca Metro stop), or a block west on Calle Pelayo. Most of the gay places are located in the area called Chueca (map). From there you can easily walk to the gay bars, clubs and shopping streets. 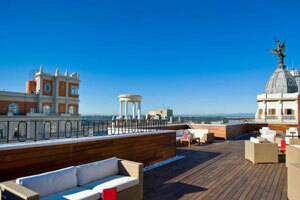 See our hotel [age for hotels and apartments recommendations and a map showing the Chueca area. In day time you can shop till you drop, hopping in and out designer outlets or some alternative street gear. Tired? Try to grab a chair and table at one of the many tables on Plaza de Chueca, where the local guys hang around. In the evening you'll find plenty of trendy restaurants, where you can enjoy typical Spanish cuisine. Late at night, the crowd moves from the restaurants into the bars and clubs, for a long and hot night out. 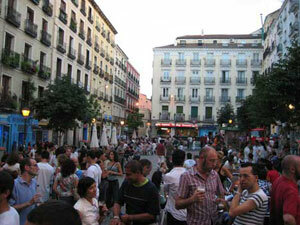 Plaza del Chueca and Calle Pelayo are the centers of all gay excitement. Cruising Bar draws an after-work crowd that usually lingers until the wee hours. A few blocks away, near Plaza de los Cibeles, you'll find Liquid, which is very popular. The leather crowd favors New Leather Club, Hot Bear's Bar, and Copper. Clubs are hot and start very late in Madrid. 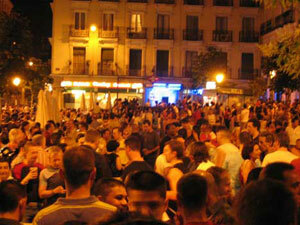 Popular clubs in Chueca are Escape (young crowd), Mito, Sunrise and Sachas (Chueca's largest). Bigger clubs are found outside Chueca. The Shangay Tea Dance on Sunday nights at Cool Club is Madrid's biggest gay dance party. Strong Center is also popular, mostly for its Saturday night scene. 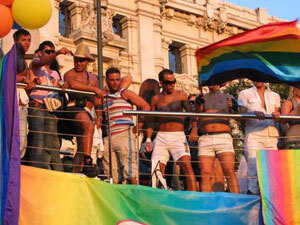 Gaypride in Madrid is one of the best and biggest gay events in Europe. Every year more guys come there to party!